Thanks to Honeysuckle White + HelloFresh for sponsoring today's post. All thoughts and opinions are my own. I mean, what’s not to love about turkey, stuffing, mashed potatoes and gravy on repeat?! Well, I’ll tell ya what’s not to love. The prep and clean-up. You have to spend hours scouring for recipes, figuring out how to quadruple them, making grocery lists, crossing your fingers that your math gets you enough apples for pie for everyone at the table, running from store to store, fighting traffic, parking and for one of the last two turkeys. And don’t even get me started on the clean-up. It’s enough to make someone never want to host any sort of gathering ever again. And, tbh, it just distracts from what Thanksgiving should be about- enjoying relaxing time with loved ones, sharing a good meal and toasting to all the things we have to be thankful for. But here’s the deal. It doesn’t have to be like that. In fact, it can be even better. Wanna know how? Well, duh, of course you do. So I’m gonna tell ya. The secret to the easiest Thanksgiving dinner you’ll ever make is…HelloFresh! 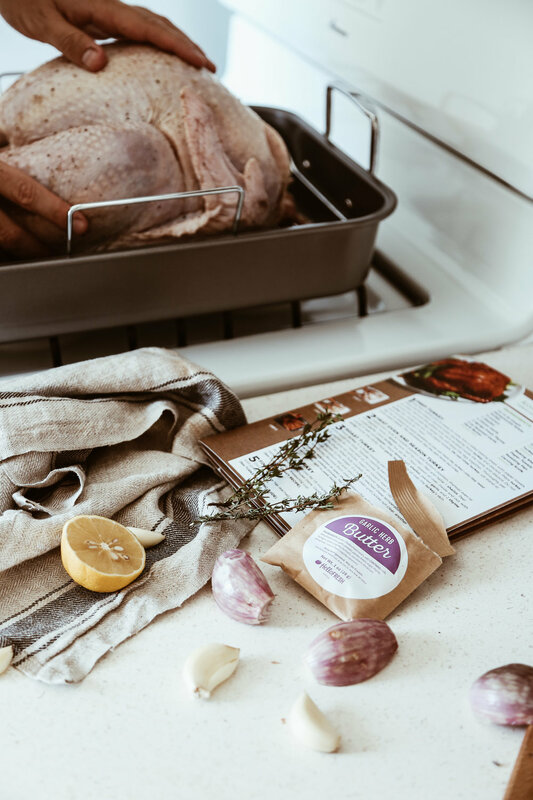 I know, I know, you’re probably thinking something like “A meal delivery kit for Thanksgiving dinner?! How will it taste? Will it be good? Can they even ship me a turkey to cook? Will my guests like it? Will I like it? Will it really make Thanksgiving dinner easier to make? !” And I’m here to tell you “Yes! 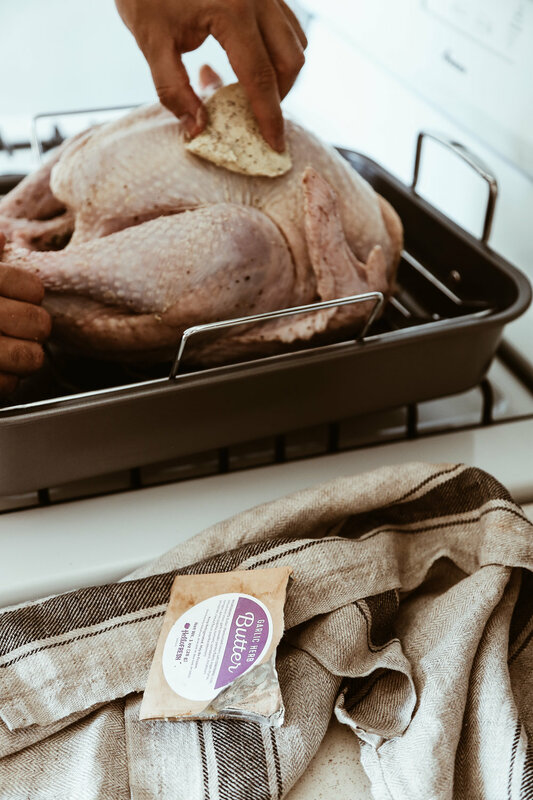 Yes to all!” It tastes insanely delicious, it’s incredibly easy to prepare, everyone will love it, and most importantly, a turkey is definitely included. In fact, HelloFresh partnered with Honeysuckle White to ensure that you don’t just get any turkey, but you get one that is raised on one of the 700+ independent family-owned farms they work with (Side note: Honeysuckle White is the only leading turkey brand to work with independent farmers to provide their turkey products,) where the turkeys are raised without growth-promoting antibiotics and no added hormones or steroids. Translation- you’re getting the best of the best when it comes to the star of your HelloFresh Thanksgiving celebration. As for the rest of the meal, how it works, how it comes together, etc, etc, here’s the rundown. First, place an order on HelloFresh, by November 8th, for the easiest Thanksgiving dinner ever. Then, wait for your box of goodies to arrive, and lastly, cook up your Thanksgiving feast. They’ve literally thought of everything for this box. It comes with all the ingredients (save for some butter and sugar), detailed yet easy-to-follow recipes, a list of all the tools you’ll need, a perfectly curated Thanksgiving playlist, tips on things like turkey carving and what you can make ahead, place setting cards that include the menu, a spot to write what you’re grateful for and a code for each of your guests to receive 6 free meals, and, my favorite thing, a 4-hour game plan. I often find one of the hardest things about cooking a big meal is figuring out the timing of everything and deciding who should do what, when, so I really appreciated this detail. It made this Thanksgiving dinner, by far, the most uncomplicated and streamlined dinner I’ve ever made. Not to mention, it took just 2 people a mere 4 hours to cook an entire Thanksgiving dinner for 8-10 people. Oh, and did I mention just how deliciously gourmet everything was?! There are no boxed potatoes or pre-made pies in sight. Instead, you’re making things like garlic mashed potatoes with crispy sage, green beans with caramelized shallots and crispy almond-panko topping, and an apple ginger crisp with a cinnamon-pecan crumble. And let’s not forget about the garlic and herb butter rub for the Honeysuckle White turkey. Total game changer! Honestly, everything was just so good, Dave and I couldn’t stop saying how we could hardly believe it was all from a meal kit. The turkey, the gravy (Omg! I wanted to bathe in this stuff! )), the cranberry sauce (that night of us could stop eating by the spoonful), the stuffing….all of it was epic. Trust me, the best thing you’ll ever do for your Friendsgiving or Thanksgiving dinner is order this magical, life-changing meal kit. I promise, if you don’t, you’ll regret it more than you’ll ever regret having that third helping of stuffing! Recipe cards and easy-to-follow instructions made cooking this thanksgiving dinner a breeze for Dave and I. Keep the table as simple as the rest of the meal by using natural linens, elegant stoneware plates and a centerpiece created with a single pumpkin, a couple of black candles in brass candlestick holders, and just enough greenery to fill out the space as needed (I like to use eucalyptus because it’s affordable, accessible and a little goes a long way, and then add in a few sprigs of pampas grass for a holiday-appropriate harvest vibe.). HelloFresh includes the cutest little menu cards so your guest will know exactly what they’re eating, from the Honeysuckle White turkey all the way to the Apple Crisp for dessert! Each card includes a line for a name, a spot to write what you’re grateful for, and a code for a few free HelloFresh meals as a gift for each guest. Don’t forget, the Thanksgiving meal kits need to be ordered by november 8th! pro tip: serve the apple crisp with a scoop or two of vanilla ice cream for maximum deliciousness!